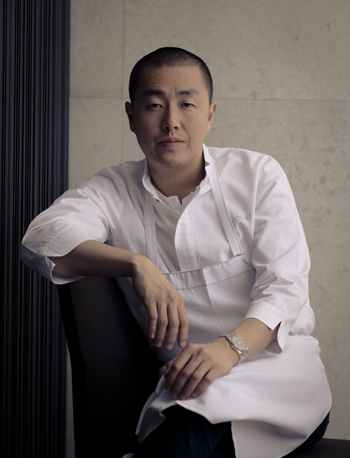 SAN FRANCISCO—The San Francisco Museum of Modern Art (SFMOMA) announces an innovative partnership with Michelin-three-starred Chef Corey Lee to create In Situ, a new restaurant on the ground floor level of the museum that will debut in spring 2016. Chef Lee will engage the global food community and reimagine the traditional restaurant experience by curating and executing a menu of dishes from recipes contributed by over 80 chefs from around the world. Participants include René Redzepi (Noma), Alice Waters (Chez Panisse), Thomas Keller (The French Laundry), Hajime Yoneda (HAJIME), Virgilio Martínez (Central), Martin Picard (Au Pied de Cochon), Olivier Roellinger (Les Maisons de Bricourt), Andoni Luis Aduriz (Mugaritz) and Dominique Ansel (Dominique Ansel Kitchen). In Situ will feature a rotating a la carte menu that will change to balance seasonality, style and geography. Lee will work closely with each chef to faithfully represent the dish both in technique and spirit. While some chefs have chosen to share a dish from their existing repertoire, others are creating something specifically for In Situ. In Situ will be located adjacent to the museum’s Third Street entrance and will nearly double the square footage of the previous restaurant. Designed by Aidlin Darling Design of San Francisco (Bar Agricole, the Windhover Contemplative Center at Stanford University and Scribe Vineyards), this project represents a unique intersection of art, design, food and community. The design of the restaurant emphasizes visibility from the street and accessibility to visitors, within a simple, comfortable, open environment. Spaces are designed to engage all of the senses with an emphasis on acoustics and tactility. The interior shell of the building will be partially exposed and is inhabited by carefully considered “artifacts” in the form of lighting, art, furniture and a wood ceiling canopy, all with the intent of drawing contrast between the rough and the refined. In Situ will remain open beyond the museum’s hours, serving both lunch and dinner. With a total capacity of 150, the restaurant will be divided into two areas—a smaller section with tables available for reservations and a larger, open space that encourages walk-ins, activity, and use of the restaurant as public space. SFMOMA will present two other options to pair food with art when the museum opens in spring 2016. On the fifth floor, Cafe 5 will offer a menu of lighter fare with a California-fusion mindset. Included will be flatbreads, fresh organic salads and artisan open-faced sandwiches. Guests will be able to dine in the rooftop sculpture garden and be served tableside. The cafe will be operated by McCalls, who also operate cafes in the de Young, Legion of Honor and Asian Art museums in San Francisco. On the third floor, Sightglass at SFMOMA will provide handcrafted coffee beverages, espresso drinks and an assortment of pastries from outstanding San Francisco bakeries and pastry chefs. Located directly adjacent to the museum’s new Photography Interpretive Gallery, visitors will be allowed to bring their coffees into this interpretive gallery as they reflect on and connect with photography. Founded in 2009, Sightglass currently operates two coffee bars and roasteries in the Mission and SoMa neighborhoods of San Francisco, and a coffee booth on Tuesdays and Saturdays at the San Francisco Farmers Market at the historic Ferry Building. Corey Lee is the chef and owner of Benu in San Francisco, where he leads a team dedicated to providing guests with the highest level of food and hospitality. Benu was awarded its third Michelin star in 2014, received four stars from the San Francisco Chronicle and earned Lee recognition as Food and Wine Magazine’s Best New Chef and a James Beard award. His career has spanned nearly 20 years of working at some of the most acclaimed restaurants in the world, including a tenure as head chef at The French Laundry. Lee is also the author of Benu, a cookbook published by Phaidon in 2015. In recognition of his work and influence, he became a goodwill ambassador for the city of Seoul, Korea, an honor given to leaders in various fields. Founded by principals Joshua Aidlin and David Darling in 1998, this San Francisco-based firm has a broad focus including institutional, commercial and residential architecture, as well as furniture, landscape and interior design. Aidlin Darling’s emphasis on designing for all of the senses has cultivated a diverse and collaborative practice that acts as the creative hub for builders, fabricators, designers, artists, engineers and chefs. They have garnered over 100 regional, national and international awards including the 2013 National Design Award from Cooper-Hewitt, Smithsonian Design Museum, a James Beard Award for restaurant design, and numerous national awards from the AIA, IIDA and ASLA. McCalls Catering and Events, a full-service catering company and museum cafe operator, has a storied history of excellence in the Bay Area. McCalls’s commitment to personalizing the guest experience and serving fresh, seasonal and organic food has been pivotal to the success of the cafes within the Legion of Honor, de Young and Asian Art museums. McCalls is proud to be certified as a San Francisco Green Business, devoted to minimizing the impact on the surrounding area and implementing green practices throughout the company. At its heart, McCalls values a high level of service, creating custom experiences for party and museumgoers alike. Sightglass is an independent, San Francisco-based specialty coffee company established in 2009 by brothers Jerad and Justin Morrison. With a passion for quality coffee and a desire to collaborate, Justin and Jerad envisioned Sightglass as an opportunity to approach specialty coffee in an immersive and holistic way. The retail locations and educational and training programs aim to provide customers with a complete line of sight and traceability, clearly illuminating coffee’s extraordinary journey—from the hand that picked the coffee cherry to the hand that serves the cup and everything in between. The Morrisons and the Sightglass team take pride in every element of their business, working exclusively with organizations that share a similar commitment to quality, service, transparency and craft-driven excellence.